Wenn man nur normale Cybots damit befördern will, sieht das neue Riesending wieder unpassend aus. Der normale passt ja auch fast schon in die GW Kapsel, wenn man das Innenleben weg lässt. This is many ways was one of the best hobby pods of the weekend, and also sadly in terms of organisation, the worst. Each hobby pod had room for about 30 people. This is the Heresy Weekender and it was inevitable that this was going to be hugely popular. With great disappointment about ten people were turned away as there wasn`t room for them to attend. Now, hindsight is a great thing but surely with everything the Heresy community has been through in the last twelve months; changes in the writing team and changes in 40k edition, the organisers should have anticipated that a lot of the attendees would want to attend this hobby pod. In one way, the small number was a positive as it allowed a more intimate discussion to take place – with larger numbers it could have descended into arguments and shouting over people. However, after seeing how popular this hobby pod was perhaps it could have been repeated after the main seminars. At previous Weekenders, several of the writers and authors have made themselves available during dinner so the intent of this hobby pod could have reached a wider audience. Nonetheless, the writing team that attended were brave. Before I go any further one key area I will raise is that they confirmed the size of the combined 40k / Heresy rules and writing team. The number is: 3. That’s all. Three people. The Heresy team is the same size as the Middle Earth, Specialist Games and AoS teams – no larger. The two members who turned up: Neil (who has been involved in the Black Books since Book 3) and Anuj (who has been recruited in the last 6 months) led the hobby pod whilst Emma (in post for about a year) stayed on the desk. This was not a led hobby pod. The guys sat down with the opening words of, `tell us what`s wrong and what you want`. This could have gone badly but for the next hour what came out was the sheer enthusiasm of the team writing the Heresy, the love of the game and the background but most importantly, the sheer pressure they are working under! I`ll return to that point later. Discussion first turned to the Dark Angels and the confirmation that Malevolence will not include them. This is not a conspiracy against the Dark Angels – it is a sheer question of volume and time. Simply put – if people want a Black Book in 2018 something had to be dropped. The Dark Angels, in terms of their narrative, organisation and background are perhaps the most complicated Legion. For them to be covered fully, they needed a Black Book of their own otherwise they would not be dealt with fully. Alan Bligh left copious notes about the Dark Angels as has John French and Gav Thorpe. All of the hints and suggestions about the different Wings, the hexamagratic organisation, the dirty secrets left over from the Unification Wars as well as all the forbidden tech that is still utilised will all be explored. They will also discuss the changes wrought by the Lion when he re-unites with the Legion. The information that we receive in Book 9 will mainly deal with the First Legion in the early-mid Crusade. Effectivelly up to the end of the Thramas Crusade and before Imperium Secundas. Later books will update and review the First Legion to late Crusade. Talk then turned to problems about certain units in the Red Books. At this point the two writers held up their personal copies of the Red Books which were dripping in post-it notes. They explained that there are several tweaks and changes they want to make either in terms of points or rules adaptions. One area they did confirm is that no options will be removed as people will already have these in their armies and they don`t want to invalidate anyone`s models. One example was Blood Angels and assault cannons, the options to exchange these with other weapons will remain but points values will change. Another area they exemplified were Destroyers, Seekers and Veterans. There will be certainly changes to these units as the view is that Veterans can do everything the others can do but better and cheaper. Destroyers are going to start to have some additional changes as of Book 8 (I`ll return to that in the next section). At this point the obvious question turned to when the Red Books would be updated. The clear message here was that it would make the most sense to wait until all the Legions were released. Otherwise, we would get one update with the Blood Angels and Scars and then a further update with the Dark Angels. The team wouldn`t fully commit to a timeline but theoretically we would be looking at least 2020 as Book 8 will be released in 2018 and Book 9 in 2019. The team did not rule out some tweaks could be made through the Black Books as well but the focus would be upon the Red Books as the main form of tweaking. Inevitably, 8th Edition raised its head. At this point they asked the audience what they preferred. One person didn`t care, they just wanted to play; one person came in favour of 8th ed. The rest were firmly 7th ed. Now, let’s be honest. That`s not a decent sample group and the team acknowledge that the online community shows a clear division. 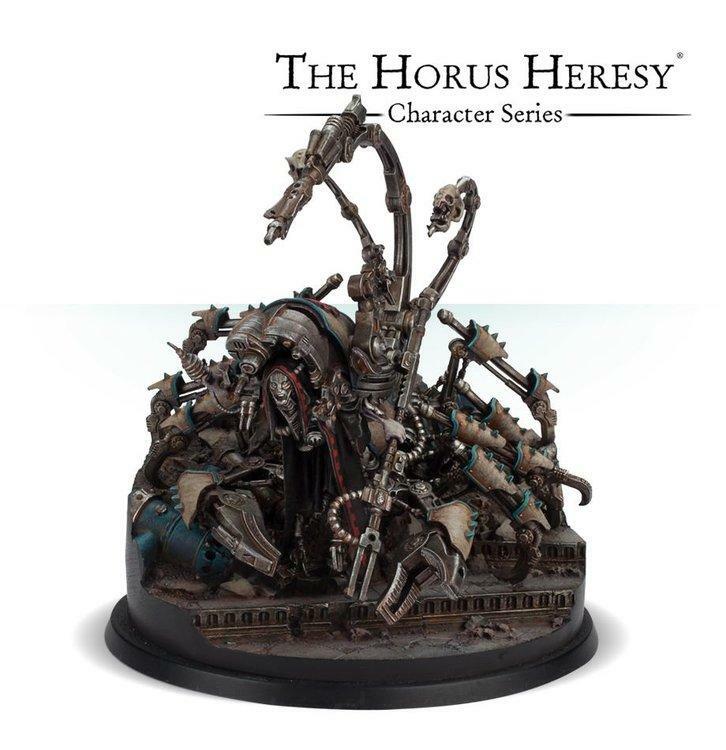 What they did confirm was there will be no rules changes until all Legions, Mechancium, Dark Mechanicum and daemons have their full rules and units. At that point there will be a review. In reality that means we will be officially sticking with the AoD 1st ed. rules until at least 2020. I have my personal feelings about these options which I`m not sharing as I just want to relay the information as I was given it. Following this, the queries of FAQs came up. Firstly, they confirmed that they have been collecting feedback from people who email in (and yes, the information does get passed onto the correct team and not just answered by the Work Experience kid). They are also reviewing the previous 7th AoD FAQ for which elements still need to be included. The team also admitted that there were a few areas that they did look at changing in the AoD rules but time was against them which prevented them from testing the changes. Queries were raised about the speed of FAQs being released. The team confirmed that only the three of them write the FAQs. If they are writing those, they are writing Book 8, or the next Imperial Armour book so that pushes the release of those products back. The team acknowledged that there was a clear desire for clarifications and answered queries but they also identified the challenges that faced them. As time was running short, the next few points were flashed through quickly. 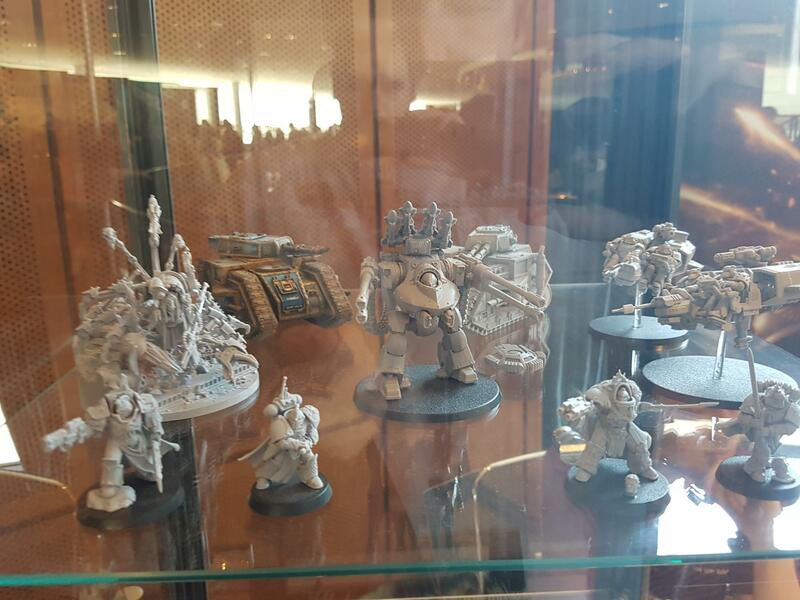 Firstly, they confirmed that Imperial Fist Tartarus pattern terminators can take storm shields. Secondly, they acknowledged that Custodes rules are tough (most of the room also agreed that this was as it should be) however, the team also agreed that some points values need to be tweaked. They also focused on self-regulation and anyone who takes three Telamon dreadnoughts should be shunned. The team are also investigating whether any of the plastic Custodes units can be transferred over. In terms of the FW units, the team are in the middle of writing 8th edition rules for their use so they will be available in 40k but time has to be given to change them over amongst writing Book 8. 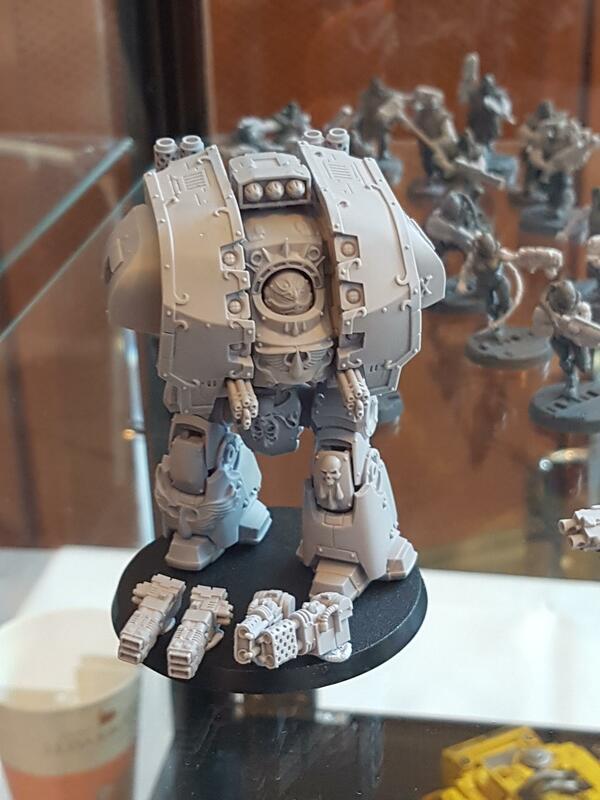 The new Knight chassis will appear for Questoris Households and Mechanicum. They will also produce new weapon options (at this point I had to stop my wallet whimpering). There are no immediate plans for new plastic AoD units but with FW not investing more heavily in plastic manufacturing, nothing is ruled out. As a final note – I will say that I came out of the hobby pod really positive. It was quite clear that there is a continuing plan for the Heresy and that the team are fully committed to keeping up the standard we are used to. The pace may slow as the team also has over commitments but the Heresy still felt alive. Simply put: Book 8 sounds really exciting. I`m not going into the reasons why Dark Angels are not included as I`ve covered that in the AoD forum section. Suffice to say that Book 9 will include Dark Angels and a full Dark Mechancium army list – not just an addition to the existing Mechancium list. The book will cover the Thramas Crusade and the assault on the Dark Mechanicum Forge World of Sarum. I will also highlight now that the impression I got was that a lot of the narrative / background was underway and nearing completion but the rules elements were in very early stages and nothing was fixed. Therefore, any discussions of rules below could change a lot by the time we get the final product – be warned! The last two forces will include a special unit and some characters together with additional rules. They reflect the holding action that the AL are performing as well as their assault on the Wolves with the VIth Legion falling back as per the novella, Wolf King. Book 8`s broad theme covers the Warmaster`s plan for misleading the loyalist legions as to his plans and weakening their counter-attacks to his drive on Terra. It also reflects the growing power of the Warp due to the Ruinstorm and the affect that it has on both Loyalist and Warmaster forces and plans. It also highlights that there are other forces at work beyond the Warmaster and the Imperium such as the Chaos Gods and the Cabal that are manipulating events for their own ends. As I mentioned in the AOD forum section, the rules team originally wanted to tweak some of the 7th rules – one of these areas was the psychic phase. In Book 8 we will see a new section added named: Psykana. This section will include new rules for pyskers and deamonology. It is not a new rules section for the psychic phase but means that there is more interaction in that section of the game for armies that don`t have a heavy-psyker presence. One of the areas that was mentioned were new options for Destroyer units such as psk-ammo to deal with pyskers… Another element included here was the option for possessed marines. These are not Gal Vobak which are marines that have chosen, and prepared for, daemonic possession. The new possessed are where a daemon has forcibly taken possession of a marine`s body. No rules hints for these but they sound awesome! There was a lot of conversation about deamons. Do not expect these to be the same as they are (were?) in 40k. The deamons of the Ruinstorm are very different in play and style to the familiar forms. All the existing daemon units that we know will be carried over into the new army list. All daemon engines will not be included however as they will suit the Dark Mechanicum list more. However, just because we have the same units, does not mean that they will play in the same way. The list will reflect the Imperium`s lack of knowledge of the Warp and Chaos especially. Part of this will be reflected in the rules (see below) and part through a lack of mentioning the names of the Chaos Gods. For the gaming audience, we will be able to see which Chaos Gods are meant but they will not be a specific mention of Khorne, Slannesh et al. The Ruinstorm is one explanation why the daemons also play differently as it feeds a lot more power to the daemonic forces than they previously had. One of the areas that is being developed is the idea of morale. Rather than being fearless or running away, daemons may fade away when failing morale. This may be similar to the 8th ed. mechanic but means that daemons won`t stay around despite taking heavy casualties. It has also been recognised that the shooting-heavy element of AoD is not friendly to daemon forces. Therefore, there will be rules that enable daemon forces to reduce or absorb the effectiveness of shooting. Individually, daemons may have a tweak of rules to help with this so people with the old 7th ed. Codex will not be able to use the units as written in there. However, this strength may be balanced that daemons may take additional damage from certain types of weapons. So may be stronger versus shooting but melee weapons cause more damage for example. Another area builds on the daemon rules in the main Rules Red Book. Daemons may have a standard profile that could be adapted by adding different options such as claws, resilience etc. Alongside this will be the idea that daemons will play the objective game differently. Daemon forces are not concerned with capturing territory or long term planetary objectives. Rather they appear for short bursts with a set of very clear esoteric objectives – Calth was given as an example of this. In game-terms this may mean that daemon armies choose from a set of different victory conditions than normal mission objectives. The team may also remove Deep Strike as a means of deployment as this comes with a set of inherent weaknesses for an assaulting army. This idea was not fully fleshed out but could include alternative deployment methods rather than the standard. The daemons will be part of the full Blood Angels write-up and be included in a Signis Prime campaign that will include missions beyond that of Fear to Tread. These missions will reflect the growing power of the Warp and the Astartes uncertainty of how to cope with this. The campaign write-up will include details on how it was Horus` plan to sideline Sanguinius and his legion. The Blood Angel write-up will focus on a lot of the differences between the 30k Legion and the 40k Chapter but will include hints on how the formation of the Chapter evolved from the Legion. One example was the Sanguinary Guard and how they function differently in 30k – they may not necessarily be jump troops for example. One key area is the role of Sanguinius within the Legion. His emphasis on his sons being more human than other Legionnaires and having a closer relationship with them is one part. Another part is Sanguinius` psychic presence keeping many of the flaws at play. Another area that was discussed were the role of the Hosts. Each Host had a different function within the wider Legion. The exception was the Destroyer Host which was rotated through so it did not fall to one particular group. Sanguinius saw this role as a `terrible burden` and all members of the Destroyer Host wore silver death masks to separate themselves from the role they performed. In game-terms, the BA Destroyer unit may form a template for future Destroyer units and an indicator of how they could change in future adaptions. The White Scars will receive the full Legion treatment and will have a campaign based around Chondrax. Once again, this is an example of the Warmaster keeping a potential Loyalist Legion away from the fighting. The AL are instrumental in keeping the Scars misinformed and off-balance however, they exceed their orders (or have their orders manipulated?) which helps bring the Scars into the wider war. The Wolves are there due to the events in Wolf King and reflect the issues facing the VIth following their bullying action on Prospero. I`m not going to delve too deeply into this as there are so many pictures and details on line and provided from Warhammer Community. What I will do is give my perspective and some insights into what I spoke to the designers about. I`m also going to focus on the Heresy models rather than the Necromunda ones. Primarchs: Sam Egan did not sculpt Alpharius – he was sculpted by Rob McFarlane instead. Sam is currently working on a 40k model but will then be returning to either the Kharn or Sanguinius. There are some rumours that Kharn may be on a jetbike… Sam did show me his pinterest board filled with concept pictures and references for both Primarchs. My God – if half of these ideas come true, then both Primarchs will be gorgeous. For Sanguinius there are loads of Enlightenments (18th century) statues and pictures of angels. Do a quick Google search for St. Michael and it`ll give you a rough idea of what Sam is thinking of. For the Kharn, Sam is researching lots of Eastern influences ranging from Persia through Mongolia and Japan. His rough idea is lots of layers, with armour, furs etc all building up. These next two will be very exciting. 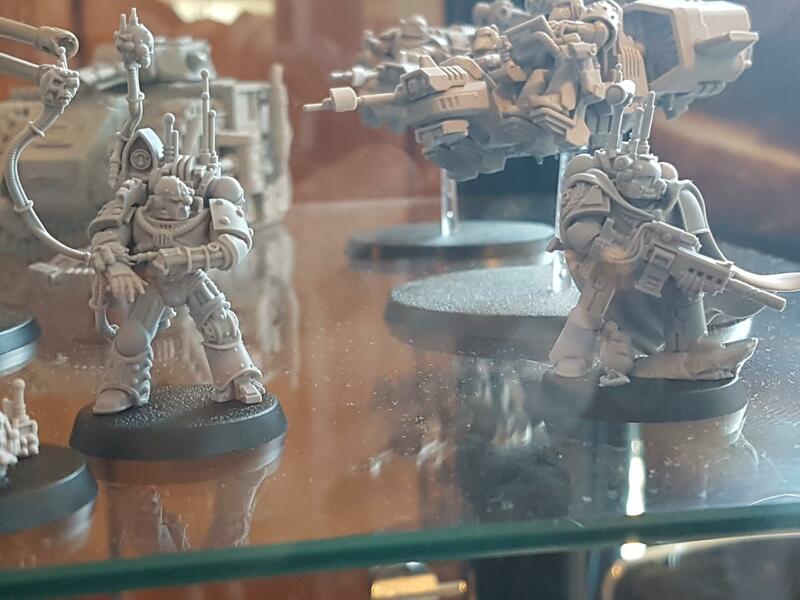 After the Primarchs, there will be an Emperor model but this may be quite fixed as the artwork is very stable. Following this, there *may* be a Malcador model. I really hope so, as I think the old boy deserves something to be recognised for his efforts. Termite: One word: awesome. I loved these little things since they were first mentioned and shown in Epic. The kit is great and comes with some nice options for weapons (heavy bolter, Volkite culverin and heavy flamer) as well as some nice internal detailing. I also had a look at the rules. The standard vehicle itself isn`t great – basically an up-armoured rhino with some slightly better weapons. The rules however, make the vehicles. It comes with `Subterranean Assault` which is the equivalent of Drop Pod Assault but for Termites and Moles (the two are incompatible however). When the Termite surfaces it uses the large blast template to cause damage to nearby units. There will be an associated Rite of War to go with the Termite model to reflect the wider use of the vehicles. Aurox Army Transport: Rules-wise this vehicle is a rhino accessible for Solar Auxilia and Militia. The SA versions comes with multi-laser and the exploratory array that all SA vehicles have; the militia version comes with a heavy stubber. However, the exciting part is the background for this vehicle and its future potential. During the Great Crusade and Compliance missions, it became apparent that the Imperial Army needed standardisation if it was too become effective as amongst the Compliant worlds there was too much diversity of troops and vehicles. The Aurox was intended to become the standard template for Army vehicles and the basis for a variety of types of vehicle. This is similar to the rhino being the basis for predators, vindicators, whirlwinds etc. The Aurox was intended to give the Army a standard vehicle that could be adapted for different needs. However, due to the Heresy, the Aurox was not widely distributed amongst the Army and was not fully developed. What this means, is that it is possible that we will see a variety of new vehicles based on this chassis. This also matches a conversation I had with the rules team where there is a desire to revisit the Army at somepoint. They recognise that the Solar Auxilia are the elite whilst the Militia are the bottom end. They feel that an Imperial Army lit could reach a middle-ground but is a long way from becoming a reality. Dreadnought Drop Pod: This should be in production in about 6 months. The copy they had at the Weekender was a 3D print and still needs cleaning and moulding. Although on the surface it looks the same there are some subtle changes. Firstly, the base is solid resin and the whole model is about 10-20mm taller. This allows a Contemptor to be placed inside. The door frames have been reinforced and the exit has been widened so it is easier for the dreadnought to leave. The biggest changes are the doors. These are now designed to sit flat and the hinges are separate. On the back of the hinges is a lug that slides into the resin base. This means that the hinges and doors are more solid and less likely to snap. There are also magnet holes on the end of the doors and the engine block so the doors stay up. Na was kommt denn da? Brauchen ist ein Wort, das wir nicht benutzen. Der korrekte Terminus Technicus ist "wollen"
Ist der Carnis Rex Knight jetzt eigentlich ein Forge World Modell oder regulär GW? Narf.. Den muss ich haben. Ja, der kommt schon ziemlich cremig. Das ist aber das Rogue Trader Kill-Team für 40k. Das hat mit Heresyleider, trotz der schönen Modelle nichts zu tun. 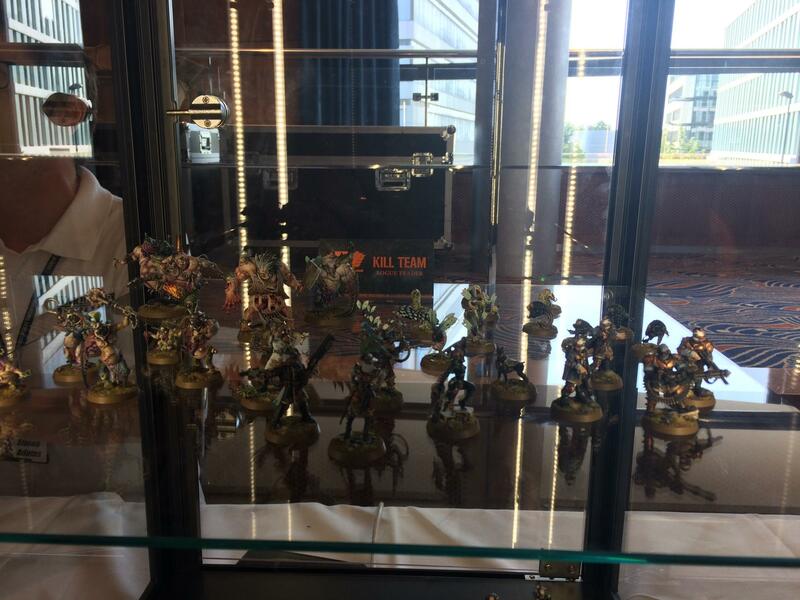 Was es heute auf dem Warhammerfest an Neuigkeiten gab für Heresy gsb, sieht man in dieser Vitrine.